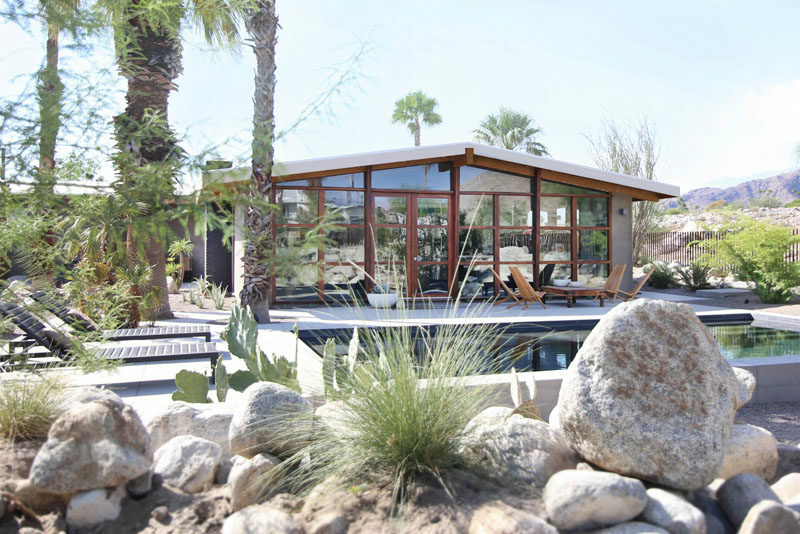 Architectural design practice Hundred Mile House, have renovated and added an addition to a custom-built post and beam mid-century ranch house built in 1954 at the base of San Jacinto Mountain in Palm Springs, California. 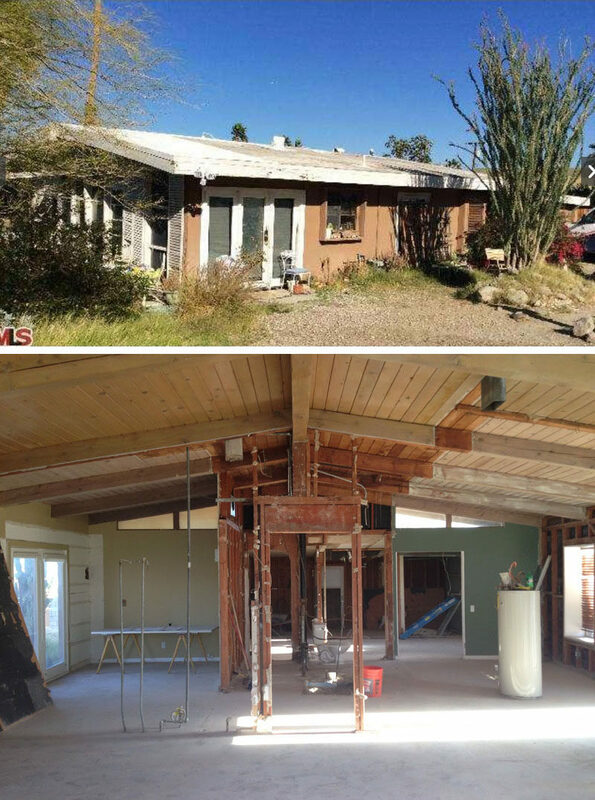 Here’s a glimpse of what the original house looked like before and during the renovation. Unfortunately the original architect is unknown. 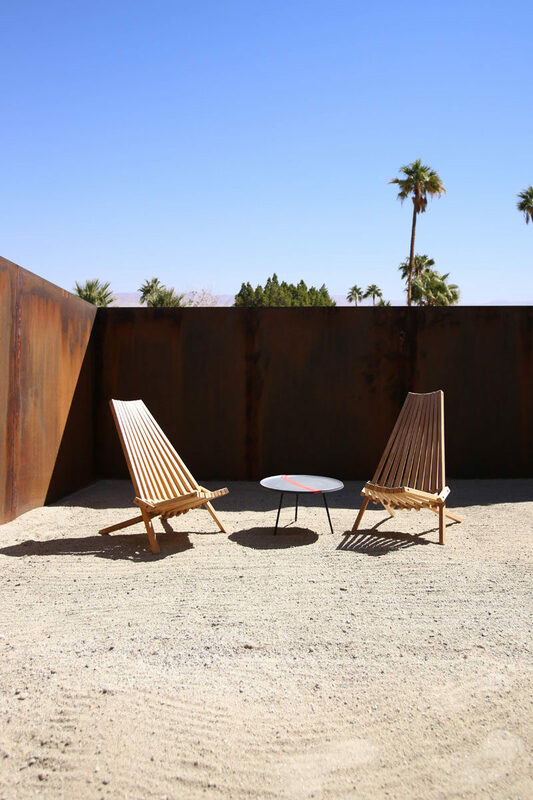 The material palette used for the house has been inspired by the desert. 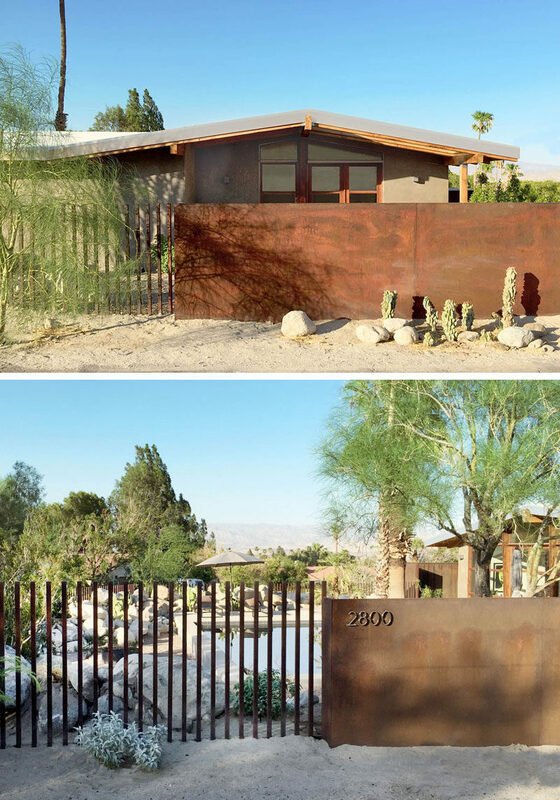 On the exterior of the house sand-colored stucco is paired with wood elements and a rusted steel fence. Behind the fence is a courtyard with desert landscaping and steps leading up to the front door. Inside the front door, there’s a small foyer with a large piece of art hanging on the wall. The original concrete floors were re-coated and sealed, with the new addition also having polished concrete to create a consistent appearance. The foyer opens up into a large open plan room that houses the living room, dining room and kitchen. The living room is focused on the black brick fireplace and a wall of windows floods the room with natural light. Just off the living room and dining room is a new patio and pool. When renovating, the designers saved as many of the original plants as possible, including a very mature Monstrose Apple Cactus. 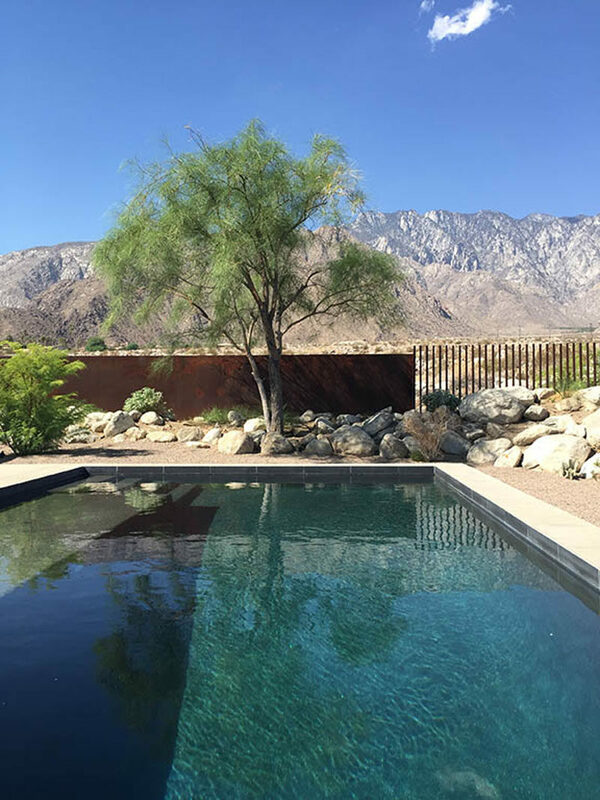 Next to the patio is the new pool that’s surrounded by landscaping that matches the courtyard at the front of the house. 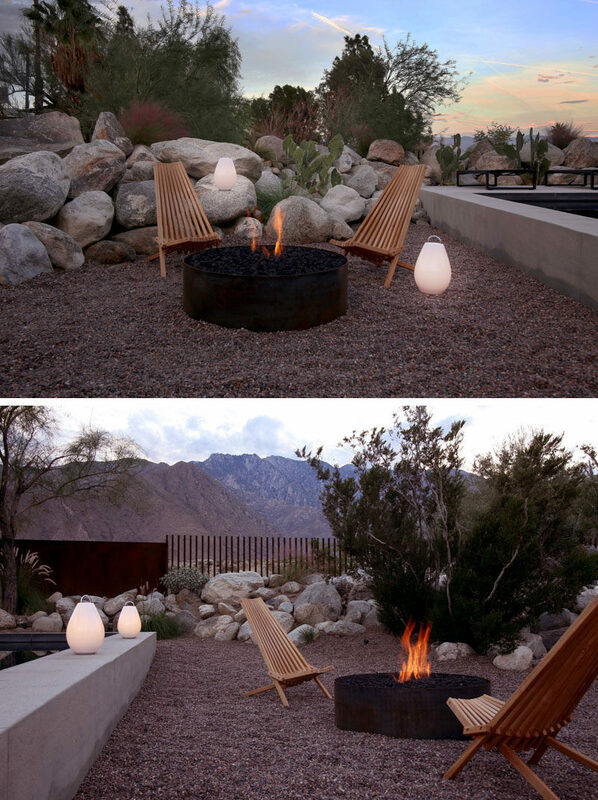 At the other end of the pool is a firepit with chairs, ready for socializing on a cool desert evening. 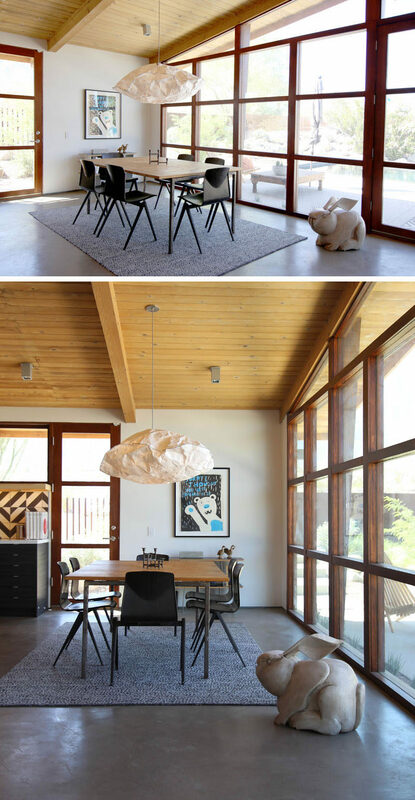 Back inside, there’s the dining room with a large cloud-like pendant light hanging above it. Beside the dining room is the kitchen. Dark cabinets have been paired with stainless steel appliances and a patterned backsplash for a contemporary look. 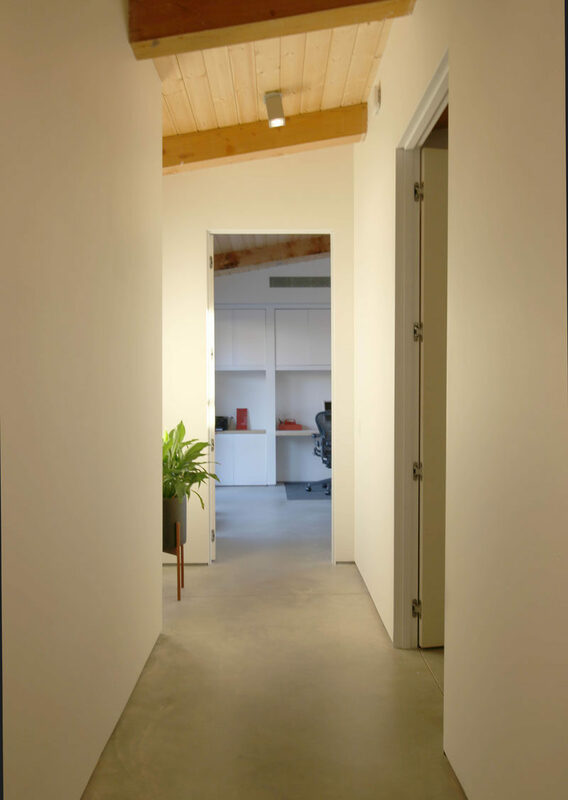 On the other side of the entrance foyer is a hallway that leads to the bedrooms and studio. 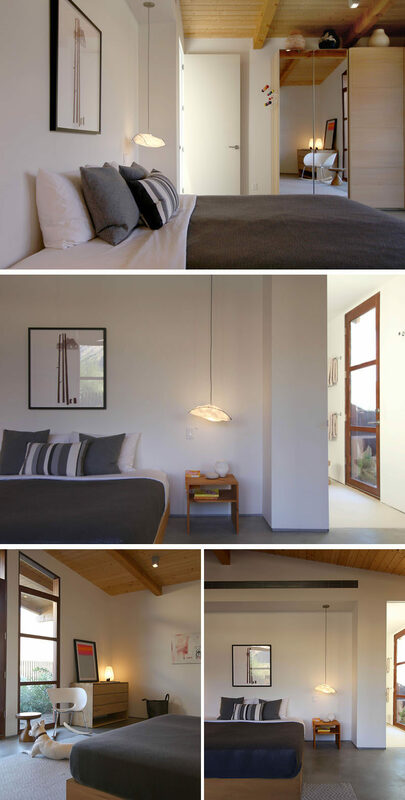 In the master bedroom there’s a vaulted ceiling that creates a sense of openness. The master bedroom opens up to a private patio with a firepit and small garden. In the master bathroom, dark tiles have been used to create an accent wall, while a glass partition separates the shower from the bathtub. The dark tiles have also been used on the wall behind the mirror and vanity. 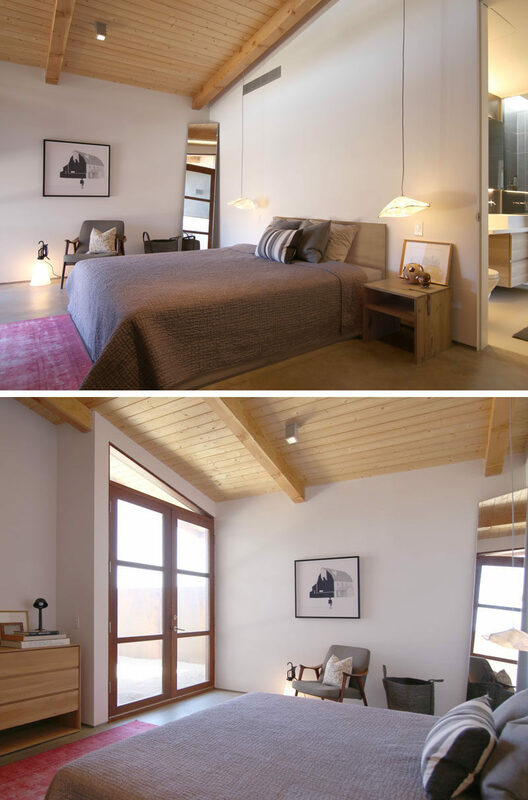 In the guest bedroom, two pendant lights hang from the high ceiling to create beside lamps. The guest bedroom also has a private patio surrounded by the weathered steel fence. 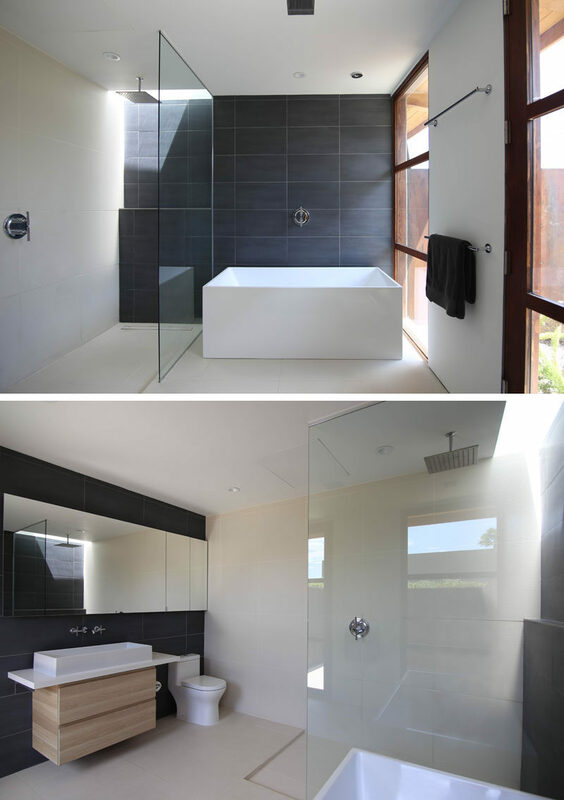 The guest ensuite bathroom uses the same dark tiles as the master bathroom. 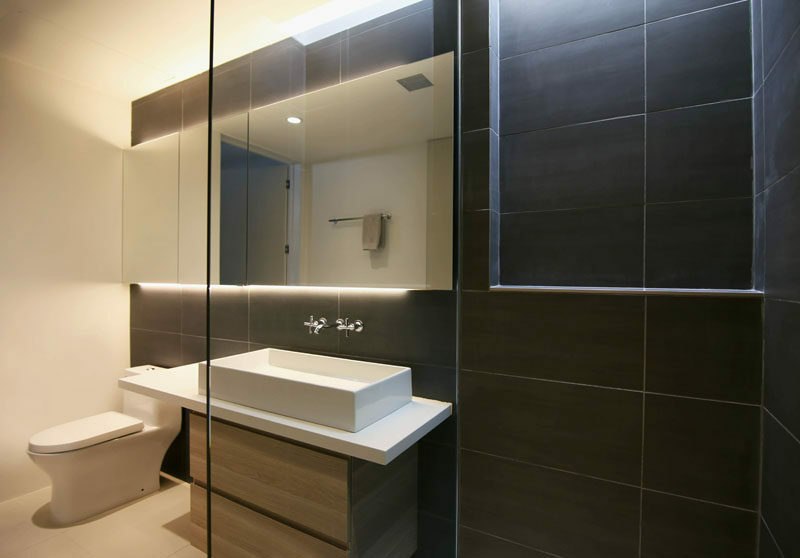 A backlit mirror provides ambient light in the room. Next to the guest bedroom is the studio / home office that also doubles as a gym. 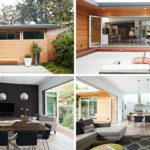 Wood framed glass doors open up to the patio off the guest bedroom on the right and the front courtyard on the left.